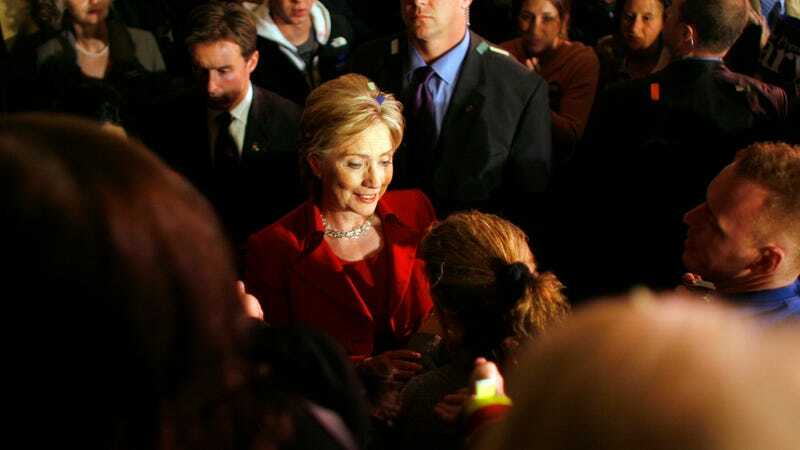 Hillary Clinton in 2008. Image via Getty. Hillary Clinton refused to fire an advisor that had been accused of sexually harassing a 30-year-old woman working on her campaign in 2008, according to a report in the New York Times. Instead, Burns Strider (what a name! ), the co-founder of the American Values Network and Clinton’s “faith advisor,” continued to work on her campaign at her request, over the objections of senior staff. Clinton has stayed relatively silent as the #MeToo movement has gained momentum, though she did issue a condemnation of Harvey Weinstein days after the story broke in which she claims she was “shocked and appalled” by the revelations. Clinton didn’t comment to the Times, so there’s no word yet on whether Clinton is “shocked and appalled” by her own choice, in 2008, to keep a man accused of harassment on her staff.